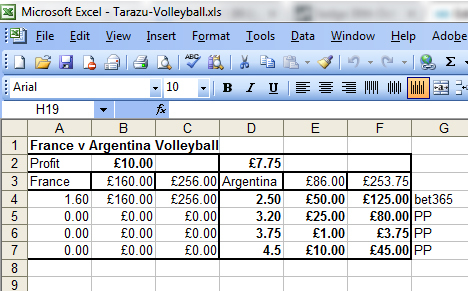 Click here to download 2 Ways Tarazu Spreadsheet (for ODI & T20 Cricket matches, Tennis etc). 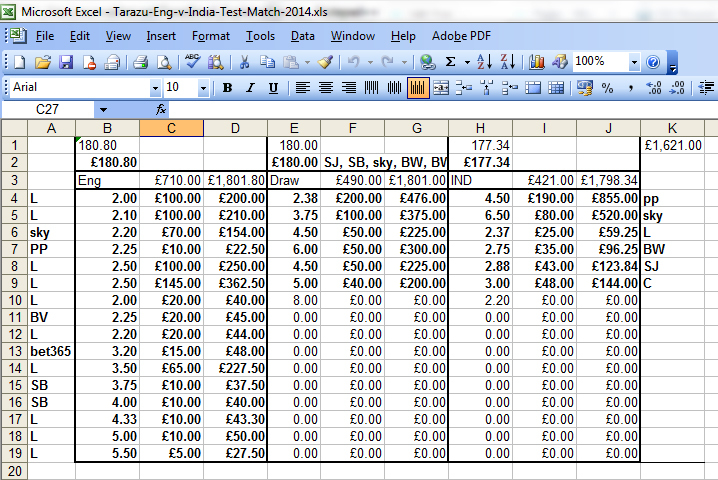 Click here to download 3 Ways Tarazu Spreadsheet (for Test Cricket match, Football etc). Tarazu is a Hindi word which means Balance. I coined this term for a strategy which is known with various other names. It’s neither a new strategy nor a rehash of old strategy. It’s the same existing strategy which I’ve just given a new name to suit to Indian punters specially to those who are not well versed in English. What is a Tarazu Strategy? You might have seen me on betting adda tipping you on Tarazu strategy for quite sometime. I haven’t fully revealed the strategy but I’m sure you clever guys might have figure it out from my various comments. You will be disappointed to know that I’ll never leak Tarazu strategy in public. The reason is simple. If a successful strategy comes to limelight all punters will start following it which will wake up bookies who will “adjust” their odds movements to nullify this strategy. This has happen to many other successfully online betting/trading strategy. Strategy which once worked and punter used to make money in the past have become almost ineffective today. This strategy is available only to exclusive members for FREE. Below is the live proof of Tarazu strategy which I applied for the 2nd Test match between England and Sri Lanka. As you can see from the strategy, I backed England heavily when the were in strong position. When Sri Lanka start to dominate I did 2 ways Tarazu between SL and Draw. 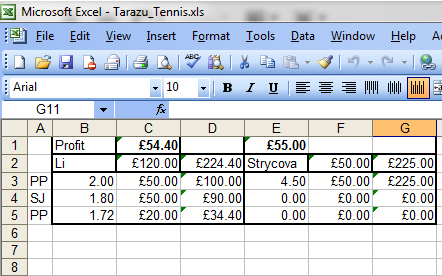 I had a lot of money already placed on England so I took off some of that money and put on SL & Draw. In this match I earned £106.83 without worrying about the match result. If it was Draw I would have won £106.83. And if by any chance England was winner I would have hit the jackpot with £1175.77. 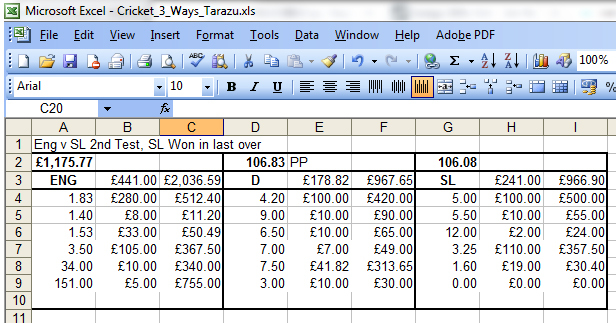 Here is another example of 2 ways Tarazu between Glamorgan & Hampshire T20 match. I had about £325 profit on both teams, it didn’t matter who won the match I made £325 on this match. Below is an example of very complex but perfectly balanced Tarazu strategy for a Text Cricket Match between England v India in 2014. I don’t remember which match was this but as you can see from the snapshot I made about £180 in profit without worrying about the result. I had total £1621 on stake as you can see on the top right corner. Below is the 3rd successful example of a Tennis match between Li Na & Strycova. I’m not sure who won but I made easy £54 profit. In the first column you will see the bookies where I placed my bet. PP is for Paddy Power, SJ is for Stan James. Yup, I apply Tarazu on virtually any two team/player sports where I see an opportunity. Below is a live successful example of Tarazu strategy between a Volleyball match between China & Argentina. I’m not sure who won the match but I made a small profit. Tarazu doesn’t work very well with Football but I’m so confident with my strategy that I even applied it successfully during FIFA world cup matches and made profit all of them. Below is an example of 2014 FIFA world cup match between Belgium and USA. Belgium won the match hy 2-1 and I made £33 profit. As you can see from the snapshot below the Tarazu was not perfectly balanced. A perfectly balanced Tarazu strategy will have equal profit on all outcomes. As I said Football is not suitable for Tarazu and that’s reason I couldn’t balance it. How Effective Tarazu strategy is? This strategy is a very effective online sports betting and trading strategy with very low risk. It’s so effective strategy that you can even use it on fixed odds sites if you don’t have account on BETFAIR. I mostly use this strategy for Test Cricket and sometimes for ODI or T20. It’s not as effective for T20 though as odds don’t move a lot and in most cases T20 becomes predictable. It’s good for ODI and works very well between two good teams. It will not work for a match between top team and bottom team e.g. India and Zimbabwe in any form of Cricket. Which sports Tarazu is more suitable for? It’s mainly suitable for 2 ways results but it can be successfully used in three way results as well e.g. Cricket Test matches. It’s not effective for Football 3 way results. But you can apply it between a team and draw in football. It can work in Tennis too if players are equally matched. It works well in Women’s tennis as we all know ladies are so unpredictable. It can also be applied for any other betting market with two outcomes. E.g. total goals in Football. Do I need to be selective about teams/players? As I said above this strategy doesn’t work for a strong favourite and weak underdogs. I works only with top teams. As a rule of thumb you can apply this strategy for a Cricket Test or ODI between any two teams from India, Pakistan, Sri Lanka, Australia, England, South Africa and West Indies. If India is involved and they are on fast pitches then include New Zealand as well. This strategy can also work on two teams from bottom tiers such as Bangladesh, Zimbabwe, Ireland etc. The first Test match between Bangladesh and Zimbabwe was a perfect opportunity for this strategy. Avoid grand slam tennis matches involving top seeded players during round robin. You can take chances in QFs onwards as by that time only, and always, the top seeders remain in the competition. As usual if match becomes one sided since beginning then this strategy will fail. There is exit strategy for each sport. I can provide exit strategy to exclusive members on request. Many Congratulations and Thanks Munnabhai for starting your personal Blog .It will help and support lot of guys like me to have proper guidance and not to fall in traps of imposters who are misguiding a lot of newbies and punters .Your vast experience will realy help a lot of serious punters here as you know this is a very lonely affair and for sharing views and guidance you are only dependent on online forums of which most of them are bogus and fraud. Just a humble request to have genuine guys to have the rights to post there since like here on bettingadda many a times jealous and murkier people come who have nothing to do with this and do “bakwaas”. This will not happen. I’m on skype munnabhaipunter if any query then ping me there. I am still not very sure about this particular strategy since the sport i follow seldom i get the opportunity for this , it can be because of my low understanding in particular to this strategy since i never get odds to apply it.Also in your Blog you have cleared it that all the nitty-gritties of the strategy is for Premium members. I’ve updated the guide with live and successful examples of Tarazu strategy on various sports including Cricket, Tennis, Volleyball and even Football. Just go through those examples and try to figure it out. It’s very simple once you get hang of it. All you need to do is to keep Tarazu balanced on whichever side you put your money. Never let it go in negative. 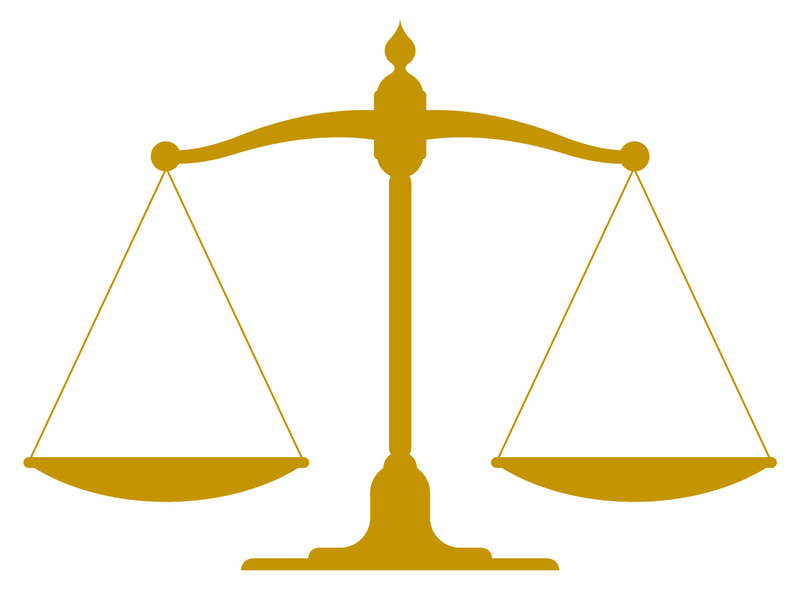 When one side is heavy then back other side, when odds increase, and keep Tarazu balanced. If you see it’s becoming one sided then make that side heavy and keep just some profit on other side. 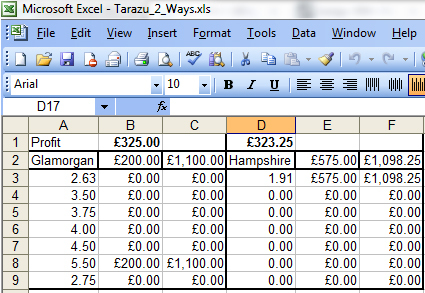 Just sent you Tarazu spreadsheet with live examples. Do some math on your own and it would become easier to understand. Please send me Tarazu spreadheets to me not the images original spreadshets. i want to know how to make the formulae for the Tarazu strategy. Wow munna bhai that’s so awesome. I’m looking at your snapshots and amazed how you manage to make profit in such complex way. Would you mind explaining how did you manage to balance profit for Eng v Ind test match? Munna bhai am a complete newbie… Want to be there in ur exclusive members group..
have sent u mails too.. I am new to betting. Could you please send me Tarazu spreadsheet so that i can explore n learn. time lagega verify hone me. agar koi problem hoti hai to support ko contact karo. back mtlb lgana n lay mtlb khana hai na?? Haan bhai….like circuit bhai asked kindly explain how to make excel sheets with rates. khai, lagayi abhi tak samajh nahi aata..
Mamu is working on bettingadda.com website update. He will create all such tools for you guys. 2-3 baar fir se padho samazh me aa jayegi, koi rocket science nahi hai. dono team ko back karna hai odds aur stake ko balance karke. ek team ka bhav upar ata hai to usko back karo, fir calculate karo dusari team ka bhav aur stake adjust karke wait karo. jaise hai dusari team ka bhav upar aata hai stake adjust karke chipka do. 5-10 bar kar sakte hao aise balance ek match me. har baar 4-6 % ka profit lo. Munna Bhai….I did not understand taraju strategy properly. pls send me your bible..
munna bhai how to contact you? Most of the time I’m live on http://www.bettingadda.com/ you can take premium membership there and ask questions there.